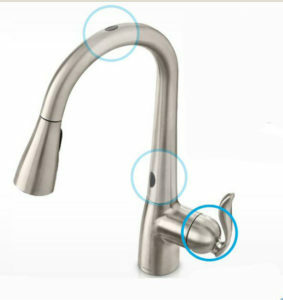 3 What Are The Kitchen Faucet Types? 4.1 What is a Cartridge in a Faucet? 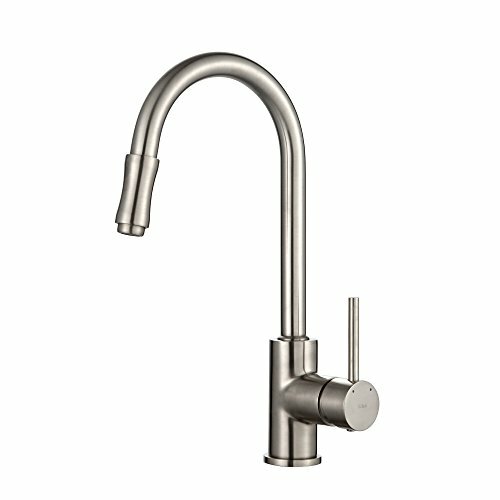 4.2 What is a Compression Type Faucet? 4.3 What is a Center Set Faucet? 5.1 What Basic Principles Should You Follow? The average American household can spend nearly 5 times as much time in the kitchen as they do their living room. You should thus be looking at the best kitchen faucets to make your cooking center a true centerpiece of your home. Below are the top kitchen faucet reviews, ensuring that you pick a unit that will fit in with the scheme and style of your kitchen, as well as be robust enough to handle just about anything your family can throw at it. So enjoy the top rated kitchen faucets and pick one that you find desirable today! head and stain resistant polished chrome finish. The tap and integral design of the faucet are incredibly light at a little over 6 lbs meaning that anyone in your home can easily utilize it. 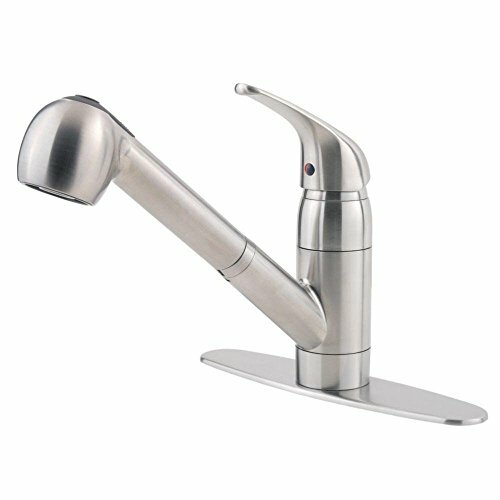 The flow rate is some 1.8gpm which is fantastically economic and the head of the faucet has three unique modes; spray mode, aerated mode, and pause to suit your needs. Cleaning a faucet head can be a time-consuming task but thanks to the MasterClean spray face with this faucet it is much easier than most. Installation is also incredibly practical and guaranteed frustration-free. The head of this particular faucet does feel a little insubstantial to some users, but it is incredibly practical and should be considered if you are looking for a sleek, timeless design. If you are in the market for a faucet with a heavy-duty, near industrial look that delivers a consistent flow then this model will be of particular interest to you. The overall look of the unit is solid yet incredibly functional, basing itself around an extendable hose with a wide angle head that will deliver water to the hard to reach areas of your sink. Having a LiteTouch Single Lever for flow control means that just about anyone will be able to utilize this unit and with a water consumption rate of some 1.8 GPM, it is much more economical than other competitors in this field. The best features do not end here, though. The Kraus KPF-1602 utilizes clever ceramic technology to ensure that it remains drip free throughout use whilst the head of the unit also comes with an incredibly handy pot filler, a feature that clean, fill and rinse your most precious of cutlery and crockery. The unit itself is installed into the kitchen via a single hole mechanism, ensuring that it is up and running in no time at all when combined with the installation tools that come as standard with every Kraus unit. We have compiled more commercial / fusion style faucets here! This is a fantastic faucet that combines a visually distinct and somewhat unique look with the performance you can expect from an industry standard unit. The water consumption is of note and the practicality as a whole is to be admired. This is also a competitively priced faucet at the lower end of full metal installations, which only works in the products favor. With some kitchen faucets, you run into issues regarding their height. Some of them can look far too large, whilst others do not have adequate space underneath them for filling pots and pans. 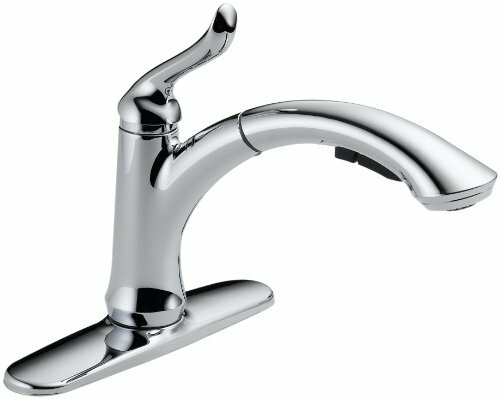 This is not an issue faced by the Kohler K-560-VS. One of its key features is the high arch spout which gives this faucet an excellent presence as well as sufficient room to maneuver below it, and it also comes with 360° rotation of the units head making it one of the most practical faucets available. And with a 1.8gpm water consumption rate, it will not cost you the world to perform in your kitchen. Kohler has incorporated three key features into the faucet to make your life a little easier. For one, with the Masterclean Sprayface, the unit is easier to clean than most. The DockNetik magnetic rim means that the head of the faucet easily reattach back into position once you have finished with it and with ProMotion technology you will find cleaning easier than ever. The appearance also matches the performance. The faucet has a smooth and elegant finish with a sleek handle that means you can fill or clean whatever you choose with ease. This is one of the best kitchen faucets on the market. One of the best things about this particular faucet is how cheap it is. Being right towards the bottom end of metal head faucets, it is affordable for many and with its looks, it will fit right many a modern kitchen. It may be wise to contact a professional plumber for its installation, however, as Kohler does not supply the best installation guide. 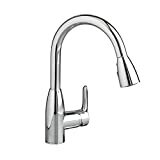 Sometimes you will want a faucet to be resistant to the wear and general tear of your kitchen. This is a box that the American Standard 4175.300.002 Colony is more than capable of ticking. Combining a scratch, stain and wear resistant finish with a lifetime warranty for the functioning of the faucet, this is a unit you will be able to rely on time and time again. 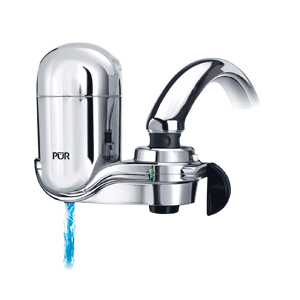 The water flow is well within the industry standard of 2.2gpm and the delivery is smooth and well-aerated thanks to the head of the faucet that combines this aeration factor with a ceramic no-drip disk valve, tested for over 1 million on-off alternations once again showing just how robust a unit this can be. There is also an integrated sprayer in the pull-down head of the unit, allowing for excellent flexibility and overall cleaning as a result. It even comes with a pause fixture to facilitate water flow. The installation is also incredibly simple, with many reporting that they could do it themselves with minimal tool work. The rate of spray is incredibly forceful, which can lead to splashing in shallow sinks and the middle of the faucet head can drip when other functions are being utilized, but this is still a fantastic product that is one of the most inexpensive you can find. Looks combine with the performance for the Kraus KPF-1622SN Faucet. Not only is this one of the sleekest and most attractive faucets from the Kraus range, but it also has some of the best performance figures on the market. Combine this with excellent functionality and an easy installation process and you have a truly premier product. The looks are not just there for show. For one, the head design of this faucet allows for excellent aeration of your water and it also incorporates the ergonomic water saving spray mode, which has the desired effect whilst reducing typical water usage and spraying issues considerably. 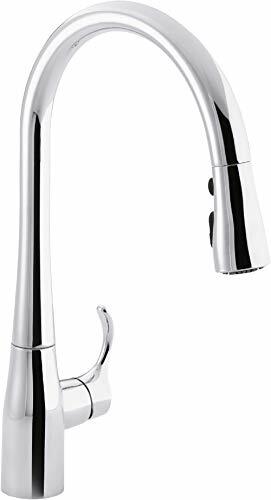 The faucet also has a fantastic stain resistant finish and the pull-out faucet head has a reach of 7 inches, meaning it is incredibly flexible if a little short too. Installation of all Kraus faucets is a breeze and this is no different. It is a single plug mount requiring minimal tools and effort and soon water will be running throughout a fantastic faucet in your kitchen space. It even comes with a limited lifetime warranty for extra reassurance. Sometimes a mix of a classic, yet futuristic look will work in your favor and this is especially appropriate for this particular faucet from Delta. With the one handle located on the top of the faucet and its smooth, clean lines and mix of non-stain finishes, visually this is one of the best pull-out faucets you could wish to buy. It is a little more expensive than its closest competitors, but for that, you get excellent reliability and one of the best performing pull-out faucets you could wish for. The flow rate, whilst far from the best is still a highly respectable 2gpm and this allows for an excellent stream or spray of water each and every time you utilize the faucet. Certified by WaterSense and coming with lead-free guarantees, this is also a faucet that will not cost the planet a lot either. The hose is also a good length, at some 10 inches and many users report that this is a faucet more than suitable for their kitchens thanks to the features outlined above. See more touchless faucets. Some faucets stay sleek and smooth, others go for an edgier look and this is something taken quite literally by this particular unit from Moen. Clean cut, edgier lines than found on most faucets dominate the majority of the design and the one handle unit also looks clean and compact upon your sink. It also has a high arc clearance and a 59-meter hose which makes it one of the most practical faucets currently available. Water consumption is admittedly far from the best, at some 2.2gpm with a flow rate of 1.5gpm but there are other beneficial factors. For one, the retractor system on the faucet with its Hydrolock system is incredibly handy for when you need to return the faucet head to its original position. Secondly, it has a limited lifetime warranty against drips and leaks. The faucet has been noted as a little too high in some users sinks which lead to splashing and can leak after a few years, however, so bear this in mind whilst you are buying. The Kraus kitchen selection has the perfect mix of style and substance and this particular faucet is no different. 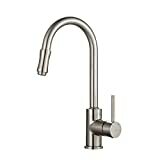 Constructed from stainless steel with a watermark resistant array of finishes, this is a single lever faucet that can really become the focal point of your kitchen thanks to its sleek, modern design and 10.75-inch height, making it rise above your other kitchen features whilst remaining in keeping with your overall design. This particular faucet has a water consumption rate of some 2.2 gallons per minute (GPM) which gives excellent water delivery. Power and precision are the aims of the game here, with Kraus’ single hole plug with dual functionality delivering a high power, aerated stream liter after liter of water. As the name suggests, this faucet also comes with fantastic flexibility thanks to the pull-out water hose that gives you an extra 20 meters of length, meaning you can position the faucet however you please. The Kraus KPF-2110 Single Lever is a little heavy to use, due in part to the weighty overall feel of the design but the excellent water delivery and competitive price make this an excellent option for you to consider for your kitchen. The Moen range is one of earmarked for its fantastic mix of practicality and style and this particular faucet, the Moen 7175 Level One is a fantastic representation of their craftsmanship in the modern age. Finished with a stain resistant LifeShine lining that ensures the faucet will endure the trials of kitchen life, this coating is complemented by the sleek, thin lines characteristic of the Moen Level collection. Water delivery is at 1.5 GPM, less than similar competitors but the power and effects of the delivery are easily comparable. There is also a preinstalled 1255 Duralast Cartridge that ensures consistent flow from the very first installation, and the integral design of the pull-out features ensures you will be able to reach problem areas with ease as the faucet neck extends straight downwards. The hose installed into this faucet extends for some 68 inches and thanks to Reflex technology, you can disconnect and thus reattach the head with supreme ease. Other features of note include the 360° rotating spout which makes tackling of tasks a breeze and it also strictly follows EPA Guidelines focused upon the safe drinking of water you gather from the faucet. Installation is incredibly simple thanks to a clear instruction guide all of the way through. Some of the quality of materials of the fittings have come under scrutiny from certain customers, namely the spout head and extendable hose but the unit is reliable and will serve you well as a faucet. Pfister is one of the best in the business if you are looking for faucets that are some of the most practical upon the market and this particular unit ticks numerous boxes. Particularly of note is that it is fully ADA/ANSI 117.1 disabled persons friendly, meaning that the pull out hose is incredibly smooth, easy to use and generally satisfying. The look is somewhat traditional, with rounded, clean edges and a good presence on your work surface. The material of the unit varies from brushed bronze to stainless steel and each and every one is stain and watermark resistant. There have been complaints about the variety of finishes and their wear rates, which is rather disappointing. The arc of the waterspout is also of a high reach, further adding to the excellent usability of this faucet. Water use is rather high, at some 2.2gpm which means this is not the most economical of units and the hose is also flimsy if water pressure is not at the highest setting. All of this combines into a faucet that had a lot of potentials but fell considerably short of the mark. With its cheap feel and lack of reliability, this cannot come as heavily recommended as the next available faucet. Whether you’re having a new kitchen fitted or if you simply want to replace your existing kitchen faucets, it’s important that you think carefully about the type of faucet you want. There are a lot of things that you will need to consider when you’re trying to decide on the kitchen faucet for your needs. You will need to ensure that the finish matches the other accessories in your kitchen for example, and you will also need to ensure that the faucet will actually fit onto your sink or counter. Thankfully, there is a lot of choices out there, so you will have plenty of stunning kitchen faucets to choose from. You will even be able to choose a faucet that matches the style of your kitchen too, for example, a more traditional style if you are simply replacing a faucet in an older kitchen, or you could choose a contemporary faucet if you’re fitting a brand new and more modern kitchen. When you buy your faucet, it will need to fit the mounting holes that you have in your sink or countertop. The way that the faucet’s pipework is laid out is known as the configuration. If the configuration is incorrect, you may find that you have to create additional holes or you might find that there are spare mounting holes. Spare mounting holes isn’t too much of a problem as you can use blanking panels over them, but for the best possible finish, it is a good idea to choose the right configuration for your faucet. Some faucets only require one hole as all the pipework is fed through a center hole and the water temperatures are then mixed into one or separated into two faucet spouts. If you have two holes in your sink or countertop, you may choose a two-hole configuration instead. The hot and the cold pipes are fed through each of these holes and the faucet can again have a single or a double spout depending on the style. You can get faucets that suit up to a 4-hole configuration. 4-hole configuration faucets usually comprise of a 3-hole configuration faucet along with an accessory such as a soap dispenser. These are generally used in larger sinks and countertops where there is more surface space to accommodate them. If you do find that you have a spare mounting hole available, you can either use a plate to cover over the hole or you could add an accessory such as a soap dispenser. There are a great number of faucet styles that you can choose from to complement the design of your kitchen perfectly. The way that the faucet is designed will ensure that you can get the best possible use out of it. Faucets with taller spouts will be easier for you to get pans and taller pots over. These styles are also fairly narrow so they don’t take up too much room. Taller spots with gooseneck styles are even better when you need the clearance beneath the faucet. 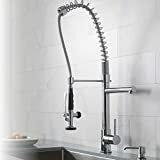 So that you can have as much functionality as possible from your kitchen faucet, you could consider getting a faucet that has a hose connected to it. These have a spray head at the end and are useful for reaching things that can’t fit in the sink properly. Swivel head style faucets are also useful accessories for your kitchen as they allow you to move the entire spout out of the way, giving you more room. This style of faucet is also suitable for dual bowl sinks. If you would prefer a more contemporary and convenient style of kitchen faucet for your home, you may be able to choose a wall-mounted faucet. As the name suggests, these are mounted on the wall and the plumbing is concealed behind the finish of the wall. This allows a cleaner finish to the sink and countertop as well as allowing you to position the faucet at a convenient height for your needs. There are many different finishes that you can choose from when you are looking for a kitchen faucet for your home. Polished brass is one of the most popular finishes available. It offers a high-quality finish and a timeless look. Whilst brass is easy to keep clean and highly durable, it is also one of the most expensive finishes, so you should expect to pay more for a high-quality polished brass faucet. If you’re not too keen on polished brass, you could choose the alternative of satin brass. This has a softer look to it instead of the bold statement made by brass faucets. Satin brass is a finish that is becoming very popular in modern homes these days. As the finish is matte, it doesn’t show blemishes such as fingerprints or scratches so you don’t have to worry too much about keeping it polished and clean. It can be a little difficult to find however and satin brass is quite expensive. If you’d prefer a darker look in a more traditional style of kitchen, oil-rubbed bronze is a great finish to choose. The darker color gives a striking appearance of white units and it is easy to keep clean and also easy to find. There are cheaper options to choosing oil-rubbed bronze finishes, however, such as chrome or nickel. Polished nickel is a darker color than chrome and it gives an elegant finish at a low cost. It’s easy to keep clean and can be matched with a variety of styles, including modern and contemporary. When you buy a new kitchen faucet, you should consider the longevity of the accessory. Especially when you have paid a lot of money for a faucet, it will be important that it will last for as long as possible You can ensure that your faucet will be long lasting by purchasing one that has good quality construction and a valve type that won’t wear out. The cheapest type of faucet is usually one that uses a compression valve type. This is only available on two handle faucets and is the most common valve type found in older faucets. It’s not practical however as it uses a rubber seal that can wear out over time. This causes the faucet to begin to drip or leak. 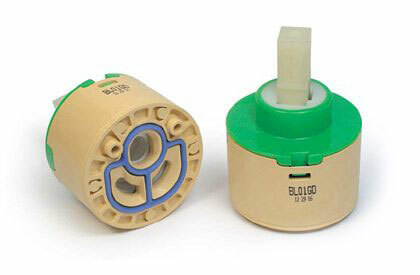 A better choice of valve type is ceramic disk. This works in a similar way to a compression valve, but it uses ceramic parts which will not wear out over time. The minimal maintenance that these faucets offer means that you will get far better value for money with this type of valve. As for construction, you should always try to choose a faucet that has solid construction. Brass is especially popular as it is heavy duty and will not become clogged with limescale. It is also resistant to stain and rust so you will not need to worry about the quality of the water or need to replace the faucet too soon. Similarly, you should look out for faucets where the valves are made from stronger material to ensure that they last longer. Cartridge valves can be a popular type of valve but they can be made out of plastic or metal, and obviously, the plastic variety is less hard wearing that the metal type. What Are The Kitchen Faucet Types? When you choose a pullout or pull-down type of kitchen faucet, you’ll be able to enjoy a highly versatile accessory. A hose is connected to the faucet, usually at the center, and there are usually one or more spouts so that you can still use the faucet in the traditional way. The hose itself can be pulled or down from the spout of the faucet so that it can be extended to the kitchen sink if needed. A pull-down or pull-out faucet is useful for pre-washing plates and pots, filling pots that are too large for the sink, cleaning vegetables and any other requirement that you may have that would benefit from the use of a hose. When you let the hose retract, the faucet should allow the attachment to gently return to its original position with the use of a counterweight. Once it has been replaced, the hose simply forms part of the faucet’s spout. Most of these kinds of faucet have a hose that is long enough to at least extend to the furthest point of the sink bowl, however, there are some that have extra long hoses. Whilst these kinds of kitchen faucet can be useful in a larger kitchen, the design of the accessory means that it makes the faucet a little cumbersome. For this reason, you may need to stay away from this type of faucet if the space in your kitchen is limited. As these faucets are more complex than others, you may find that they carry a higher price tag too. Hands-free faucets are the latest type of kitchen faucet to be made available to consumers. Without needing to touch the faucet at all, you can easily activate the stream of water. With the risk of the spread of bacteria from uncooked meats and handling waste, it’s not surprising that these faucets are becoming popular, especially in more industrial settings. If you do decide to choose a hands-free style kitchen faucet, you may also want to add a hands-free soap dispenser too. This would mean that you wouldn’t need to clean the faucet or the soap dispenser after each use. You would also be able to eliminate the danger of contamination. These faucets work using an infrared sensor that detects movement in close proximity to the faucet. Once activated, a stream of water is released for a short time and automatically stops when it is no longer needed. 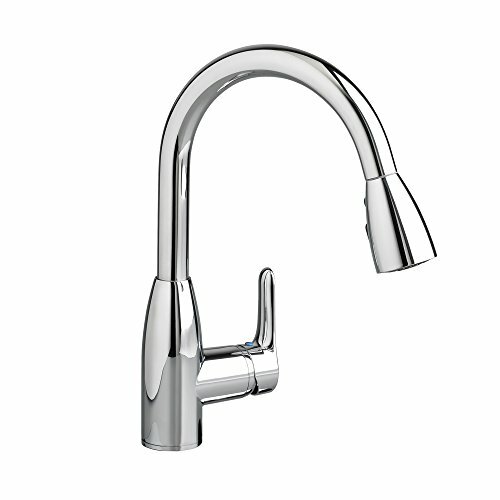 If you would prefer to have a faucet that offered both handle and hands-free operation, these are also available. The lever allows you to control the temperature of the water but you could also turn the water stream on or off using the faucet lever too. Although these latter hands-free and lever hybrid faucets are not as widely available, they are still a possibility for the consumer. 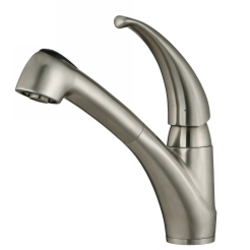 Hands-free faucets usually have a single spout and feature a simple yet elegant design. They are not only functional, but they will also complement the other accessories and fixtures in your kitchen. If its ease of use and simplicity of design that you’re looking for, then the single handle kitchen faucet may be the choice for you. This is such a popular type of faucet these days that around 80% of kitchens have one. These faucets feature a single spout that is often tall and curved so that you can get deep pots under it. Single handle faucets, as their name suggests have just one handle. 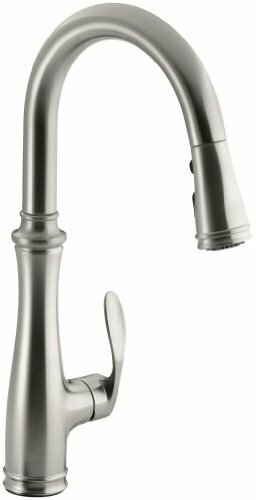 This handle can be pulled or pushed easily to turn the faucet on or off and offers single hand use for convenience. The single lever is not only used to control the flow of the water, but it also controls the temperature of the water too, offering the maximum possible convenience. When you are installing this kind of kitchen faucet, it is important that there is enough clearance behind the faucet to allow the lever to be manipulated fully. Sometimes, single handle faucets feature longer levers that can have their motion obstructed by being too close to a wall. These faucets are usually designed for single hole configurations and offer an elegant and minimalistic appearance. You should choose one of these faucets if you have a single hole configuration in your sink or worktop to avoid needing to cover over any spare holes. You should also remember that the single lever faucet has a single spot which will look the best when set at the center of the sink. Two handle faucets come in a variety of styles. 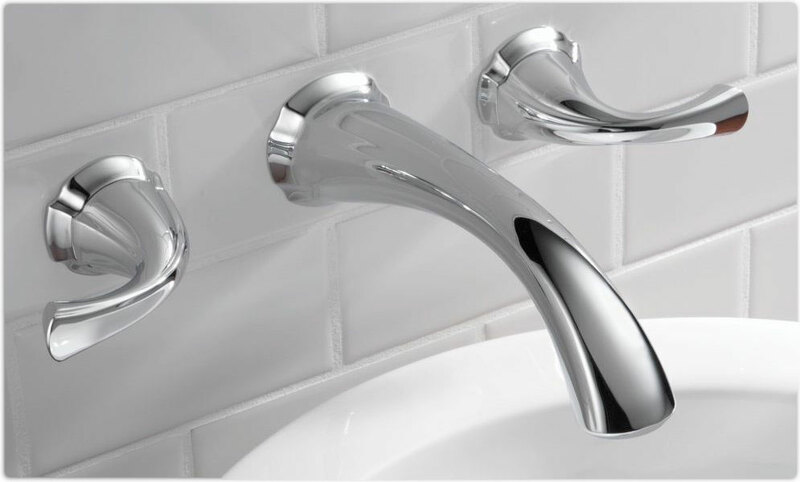 Whether you want old-fashioned two-handle faucets that come as 2 separate pieces, or if you want an all in one style design, you will find hundreds of models available to choose from. Unlike with single handle kitchen faucets, two handle faucets control the cold and the hot water flows separately. You should take care to check what kind of valve the two-handle faucet uses. Whilst the cheapest kind of 2 handle faucet may seem like a good enough option, especially if you are on a budget, you may find yourself replacing the faucet sooner than you’d hoped if you choose one with a compression valve. Depending on the space that you have in your kitchen, you may opt for a two-handle faucet that has a swivel style spout. This will allow you to swivel the spout out of the way for convenience when you are not using it. You could fill your sink for example and then swing the spout out of the way so that you have more room for washing up. Two handle faucets with a single spout are available in a variety of sizes and styles, so whether you would like a spot that is high and arched or one that reaches out into the sink for convenience, you are sure to find a design of faucet that will suit your needs. The two handle faucets are available in all kinds of finishes and construction types so that you will be able to choose the one that suits your budget and that will also fit well with the design of your kitchen. Wall mounted kitchen faucets are also known as pot filler faucets and they are about the most convenient faucets around. If you have a sink that is molded into the worktop and you don’t want to drill holes in the worktop, you could install a 2-handle wall mounted kitchen faucet. They’re also a great option if you simply want a faucet that will be out of the way when you are not using it. The wall-mounted faucet is obviously mounted to the wall. The pipework is usually concealed in the wall. The spout of the faucet is hinged in two or more places so that it can be folded out and then folded away again for convenience. The drawback of the two handle wall mounted faucet is that they often are only designed to use the cold water supply, so sometimes you will need to have an additional faucet to go with it. This is because the two-handle wall mounted faucet is generally used as a pot filler for larger pots that won’t fit under a standard faucet or in a sink. You will be able to swivel the faucet spout out to wherever it needs to be, as they can extend to around 20 inches or so. As they are mounted to the wall, they can also be positioned to be relatively high up too. The configuration of two handle wall mounted kitchen faucets, despite their name, is usually single hole. This allows for only the hot or cold water feed to be connected to it. It’s always a good idea to use water that is as clean as possible. Whether you’re cleaning the dishes, filling up a pan to use to cook with or if you’re washing the ingredients for your salad, the purest water will ensure that you and your family will be as safe as possible. There are many water filtration systems that you can purchase for your home or just for one zone in a room. If you would like to use filtered water in your kitchen, you could install a water filter faucet, or alternatively, you could use any faucet you like when you install a separate filtration system. You can purchase under sink water filtration systems that allow you to then attach your faucet pipework. This will filter any water before it even reaches your faucet. You should be aware that there are some running costs involved with this kind of setup. You will need to use a filter for the system. This filter will probably last for between 6 months and a year depending on which model you purchase. You should check that the replacement filters are available for you to purchase and you should also check their costs. Some filters can be more expensive for others, and the filter systems require you to use the exact filter that is designed for that system. You can add a water filtration system any time you wish to your faucet, so if you have already installed a kitchen faucet, you can add one even if you’ve been using the faucets for a while. If you were installing new faucets, it would be even better to install the filtration system along with the faucets, as this will prevent any limescale or minerals from ever passing through the faucet. What is a Cartridge in a Faucet? A cartridge in a faucet enables the faucet to have a washerless design. Essentially, this washerless control valve ensures that the flow of water through the faucet can be controlled without worrying about any parts of the faucet perishing over time. The main problem with faucets that have washers in is that the washers eventually show signs of wearing and this leads to leaks and drips. The only way that this annoyance can be fixed is by replacing the entire faucet. With a cartridge system, you can choose from a single or a two-handle faucet type. The cartridge may also have a brass or a plastic body. A cartridge that is intended for a two-handle faucet will simply work by turning the faucet handle. This will control the flow of the water in a similar way to the older style faucets. In order for a cartridge to work with a single lever faucet, however, it is necessary to use an additional type of control valve so that the handle can control both the temperature and the flow. What is a Compression Type Faucet? A compression faucet has 2 handles and is one of the oldest types of faucet around. Although they are common in older homes, they are not as popular these days due to a fundamental flaw in their design. These faucets are inexpensive and rely on a basic mechanism where a seal or washer is compressed against a valve to stop the flow of water when it is not used. The problem with this kind of faucet is that the washer will perish over time and replace the washer isn’t usually a simple process. For that reason, the faucet can develop drips and leaks and the only way to remedy this is to completely replace the faucet. What is a Center Set Faucet? A center set faucet is one that is designed for mounting to sinks with three holes. They have two handles that are spaced 4 inches apart and these are used to operate the hot and the cold water flows separately. At the center of the faucet, there is a single spout and this mixes the flow of the water from the hot and cold pipes to provide a single stream of water. The handles and the spout are usually molded together into a single base unit so that the faucet essentially comes in one single piece. Other types of center set faucets feature two separate handles and a separate spout that are all then mounted to a center set plate to keep them in place. This is a more traditional looking faucet type. If you would like a wider faucet type or if you don’t want to have a spare mounting hole if your sink has 3 pre-drilled holes, then a center set faucet is probably for you. What Basic Principles Should You Follow? The key overarching theme here is that no matter what you are looking for, do not compromise quality over cost. Important background research is a must, as all too often the cheapest option available to you will be far from the right one. A faucet is not only meant to be able to clean dishes with ease, but it is meant to also be the centerpiece of your kitchen and should thus not be looked over in a hurry. Is your water hard? Do you need a kitchen faucet water filter? Finally, you should also consider in good depth how often you will realistically use the faucet in question. Will it be required to regularly withstand the punishment that your household throws at it, or will it be a primarily decorative item to spruce your kitchen up? You should also pay close attention to the number of installation holes your sink comes with. Typically in newer homes, the number of holes, or ‘plugs’ in the buying guide above is less as it saves on materials, but for some older homes, more plug sockets will be required. Some faucets also come with accessories attached that install under the baseplate the unit sits on, so space for a soap dispenser and side sprayer, amongst others, will be ideal. We have just posted a step by step installation guide! Aquasource is one of the few kitchen faucet manufacturers that fully understand their clients. Aquasource faucets are not only very practical and durable, but they also have a distinct, Mediterranean feel. 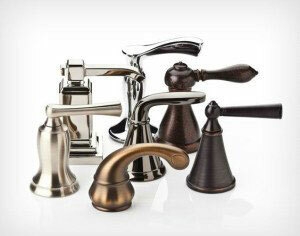 The majority of the faucets this manufacturer provides come bronzed and ready for a quick and easy installation. Most of them offer the possibility of multiple connectivities. In order to install them, you only need a low number of tools. Due to the fact that the faucets have bronze finishes, they will be highly stained and scratch resistant. The head of the faucet is also nicely shaped and sized, so it will be easy to use and handle. 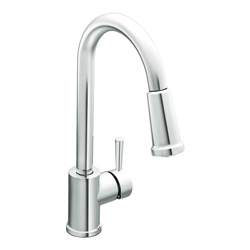 The taps allow you to adjust the water temperature to the exact level you desire with excellent precision. Because this is a largely unknown brand, you’ll be able to purchase these models at a great price, compared to that of the competition. Just imagine that at this price, you’re not only buying a faucet, but you’re also investing in style and comfort. Delta is a well-known brand that has delivered high-quality products and services for over 50 years. They always developed beautiful and highly functional faucets and kitchen accessories. They offer the widest range of touch faucets. All of their faucets are electronic and benefit from Delta’s five-year warranty. All of them have pull-down designs. Delta also designs bath fixtures, so you’ll be able to have your favorite models and finishes throughout the entire house. The models they develop always benefit from their cutting-edge patented technologies, such as MagnaTite dock and/or DIAMOND Seal. Because they benefit from these technologies and they use magnets that never wear out you can be confident the faucet will always perform perfectly. Delta faucets always have the best finishes. Their designs use chrome, Venetian bronze, stainless steel, and champagne bronze as finishes options. Besides the color option, you can always use the Delta Brilliance Finish, making sure your faucet will keep looking as good as new for years. Here is the difference between stainless steel vs chrome. A great feature of all Delta products is the warranty they offer. Even though you’ll most likely never have a problem with one of their products, if disaster strikes, you’ll be able to change any component without any problems. Danze is a highly recognizable brand in the faucet world. Most of their models come with chrome finishes and have a great, modern design. Danze has always manufactured some of the most attractive models in the faucet industry. The quality and consistency of their faucets are world renowned and indisputable. A great feature of all Danze faucets is their integrity. When you look at one of their models, you can’t find a single thing that doesn’t look as if it belongs there. That’s because there isn’t one. All their designs are well assembled with components that work well together. Owning one of their faucets will add style and function in any kitchen. If you own an open-space dining room, a Danze faucet will most definitely boost your ambiance. Despite the high-quality components, Danze faucets are really easy to install, even if you don’t have any kind of experience in this area. They usually come with all the materials you need for the installation in the box. Even though they encourage you to set up the faucet all by yourself, you can still benefit from the extended warranty. Glacier Bay is used by the famous retail store Home Depot as the kitchen and bath product line. They design and create highly functional pull-down faucets. This company delivers the faucets with an easy to understand and follow the instruction manual. They also have multiple how-to videos online you can use when you decide to install the faucet yourself. The videos are very clear and instructive, and it would be a shame not to try and install the unit by yourself. The company uses many different styles when they make a new design. This is why you’ll be able to find teapot designs, compact chrome finishes, ceramic finishes and swan-neck designs in their portfolio. Most of their models are low-priced, so you’ll get what you pay for. Some of the components may wear out or break in time, but the limited lifetime warranty you get when purchasing a model will allow you to change the broken part without any extra cost. There are several videos online that show you how to repair the faucets, as well. Grohe was the first company to use the pull-out faucet in the USA. Their models are usually ergonomic, have lots of cool, unique features and are easy to use. This company’s faucets come at different prices, so while some of their models are true bargains, some might seem a little expensive. Grohe is better known for their bathroom faucets, but they’re really making good progress in the kitchen area, as well. Actually, in 2012 they’ve won an award for “design team of the year”. This company always uses the latest technology, so you’ll be sure the model you’re buying will keep its edge and functionality for many years. All of their products come with a limited lifetime warranty, so you can rest assured that any parts that might deteriorate will be changed without any additional cost. Grohe is a company with high standards, and you can see this in every product they develop. Located in the USA, Waterstone maybe one of the pioneers in producing luxurious faucets. With high-quality products, amazing details and finishes, they manage to get the attention of creme de la creme. The majority of their faucets have a gorgeous classic design that suits almost any kitchen. When you read our Waterstone reviews you can decide what faucet you are really looking for. The moment you own a Waterstone faucet, you will realize that you buy an American quality and reliability. This faucet manufacturer can be considered one of the leading ones. As one of their products, kitchen faucets are durable and great-looking too. You can easily notice that Hansgrohe kitchen faucets come with a minimalist design and perfect finishing. The amazing mixture of functionality and good-looking makes it easy for you to choose this brand. 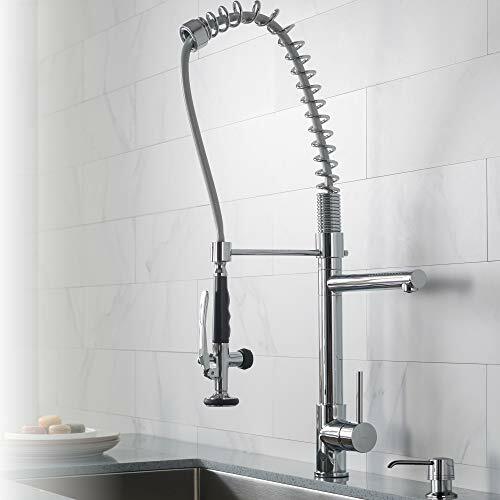 Whatever kitchen faucet you’re searching for, Brizo offers you a huge collection of products that can help you meet whatever goals you’re seeking. Accompanied by nice-looking designs and latest technologies, Brizo faucets are classy and innovative, functional and secure. Once you obtain a Brizo faucet, you won’t exchange it for any other brand, whatsoever. Kingston is one of the most recognizable brands in the faucet industry and that is understandable. Not only are their models priced below average, but they also offer excellent reliability, immense practicality, and an easy and quick installation. Their manuals have detailed instructions that are easy to follow even if you have no previous experience with installing faucets. Every model they design and produce has an excellent reach, so you’ll get all the help you need in the kitchen. Kingston faucets look the part, they are solid and evidently well crafted. They offer an extensive product line. Kingston became one of the most recognized brands in the industry because all of their models are reliable and durable. Their construction and design make the faucets to rarely break or leak. Their customer service is very helpful and gives you great tips and advice every time you need one. The main material used for faucets is brass, which makes them very durable. Kohler is a popular faucet manufacturer that designs and creates great products. Their models usually benefit from special trademarked features, which give them an advantage over their competition. Their pull-out faucets blend design and functionality while providing an ergonomic sprayer for a more easy and comfortable use. Most of their models feature a single lever handle that allows you to control the intensity of the flow and the temperature with only one hand, while you can use your other hand to clean the dishes. All Kohler faucets gave a design that’s very pleasing to the eye. But when you decide to buy a faucet, you want a product that’s highly functional. Well, in this department Kohler will not disappoint. Using only the latest technologies for their products, their models will exceed all your expectations. They have a trademarked sprayer setting called Sweep that helps with sweeping all the debris off the dishes. All of their products come with limited lifetime warranty. Kraus is not a well-known brand that produces great faucets. Most of their models can go head to head with those of better-known brands without any kind of trouble, and they only cost a fraction of the price. All of their models come with a limited lifetime warranty, so you don’t have to worry about paying for any defective product. They also have a great customer service. Any kind of problem you might have, they’ll definitely have the right answer for it. 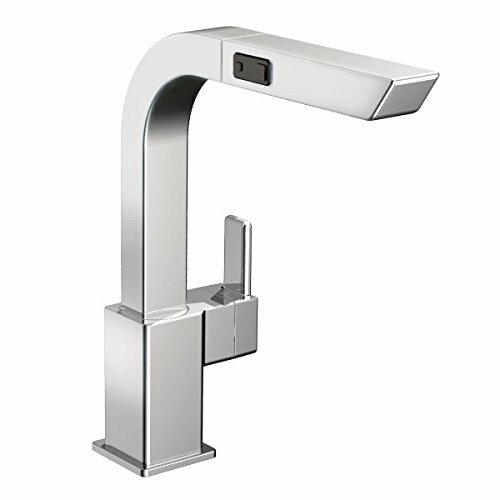 Even though Kraus makes constant investments in technology updates and improvements, their faucets are budget friendly. All of their units include Neopearl aerators and ceramic cartridges, and at this price range, they really are a bargain. Because they use this kind of high-quality materials, you don’t have to worry about leaky faucets. To make sure all their products are well manufactured, Kraus tests every faucet with both air and water before packing. Moen founder help over 75 patents in the plumbing, so it’s easy to understand why this company is all about innovation. Besides using the latest technology available, Moen design surprise with their stunning great looks. To top that, they also provide excellent customer service. Most of their models come with one of the three patented finishes: LifeShine non-tarnish, SpotResist Brushed Nickel, and the Stainless. Moen offers a limited lifetime for all of their faucets. If for some reason, something goes wrong during the installation, or later on, you can always contact the customer service and they will deliver the part you need in the following day, without any trouble. More than that, they also send you detailed instructions on how to do the repair by yourself, so you don’t have to spend extra money on a plumber. All these things considered, Moen is a great company that delivers high-quality products with cutting-edge technology and unique designs. Pfister is a well-known brand in the faucet industry. Their models have an interesting, industrial look which will fit in nicely in any modern kitchen. Pfister products are cheaper than the competition, and with the classical finishes they have, some might consider them a bargain. This company has more than 100 years of experience in the industry and is well renowned for their innovative, quality products. All of their models benefit from a limited lifetime warranty. Their products are really easy to install. Even if you don’t have a lot of experience installing faucets, you could probably do the installing yourself. But that’s not the case because all of their units come with detailed instructions manuals that explain the process step by step. Not only that but they have several videos online you can follow to make sure you do it right. If you encounter any problems, you can always rely on their customer support for help. Vigo is one of the lesser-known faucet brands. They have many interesting designs, whether you’re thinking about buying an industrial or a homely unit. Vigo offers a limited lifetime warranty for all their faucets and their components, as well. Their customer service is great and they have an answer to any question you might have. They actually encourage you to get in touch with them, and have a live chat feature on their website, to make this interaction smooth and quick. They will always replace the damaged parts, and there have been several instances when they even replaced parts that were out of warranty. This only shows how much respect they have for their customers. All of their units come with detailed, easy to follow instructions. Even if you don’t have any experience with plumbing or general house repairs, you will be able to install the faucet in no time whatsoever. You will be impressed with the construction and performance of these faucets. Hopefully, the above advice on finding the best kitchen faucets has been of some use to you in your quest to find your ideal kitchen fitting. Remember to regularly read up on the kitchen faucet reviews found here if you are in the market for an affordable unit and to use the advice presented above throughout the whole buying process! Remember the key steps to buying presented above, be mindful of our advice and soon you will have a brand new, attractive faucet installed throughout your home!